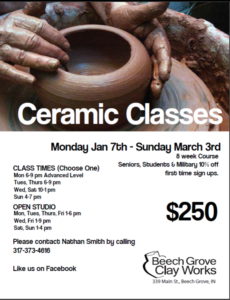 Beech Grove Clay Works is a ceramics studio located approximately 15 minutes from downtown Indianapolis, in the city of Beech Grove. 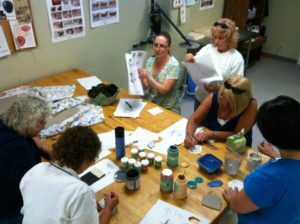 We offer ceramic classes for adults at any skill level. A majority of our members have been with us for a while, but we love seeing new faces. Classes meet once a week, typically for 6 to 8 weeks. In addition to meeting once a week, members enrolled in our classes have unlimited access to Open Studio times. We also host several events, workshops, and fundraisers throughout the year for both members and non-members. For more information, stop by the studio during any Class time or Open Studio time for a tour. You can also e-mail us by using the contact form below, or give us a call at 317-501-8759.